El universo tiene un propósito? (Does the universe have a purpose?) This was the question at a Nov. 13 debate near Mexico City between some of the heavy hitters in the atheism-theism arena. The debate was unusual in that instead of a one-on-one bout, it was a three-on-three tag team brawl that pitted a trio of theists — Biola University professors William Lane Craig and Doug Geivett, along with Rabbi David Wolpe — against atheists Matt Ridley, Michael Shermer and Richard Dawkins. The debate occurred on the final day of the third annual “International Festival of Great Minds,” a sort of Mexican version of “TED Talks” where mostly secular thinkers from a variety of disciplines are brought together from around the world to speak on a certain theme. This year the theme was “The Origins of the Future” and included such prominent intellectuals as Malcolm Gladwell, Chris Anderson and Stephen Pinker. The elaborate stage design for the debate included jumbo screens and a regulation boxing ring with a podium in the center where debaters alternated throwing intellectual punches in short segments of allotted time. Prior to the debate, the theme from “Rocky” played over the PA system. “It was the most unusual venue I’ve ever debated in,” said Craig in his newsletter recap. 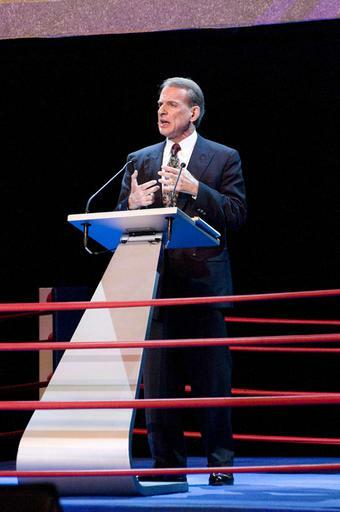 Hosted by Mexican journalist Andreas Roemer, the morning debate was held in front of a live crowd of 3,000 and was televised later that night to an estimated 2 million viewers who tuned in, appropriately, directly after the conclusion of a major televised boxing match between Manny Pacquiao and Antonio Margarito. In the theistic corner, Craig, Geivett and Wolpe collectively argued that if God exists, then the universe has a purpose, but if God doesn’t exist, then the universe is purposeless. Though their participation in the event had only been confirmed about four weeks prior to the event, the theist team was able to develop a strategy over e-mail during the weeks prior to the debate. The presence of Dawkins “in the ring” with Craig was noteworthy. Dawkins, author of The God Delusion and one of the world’s foremost “new atheists,” had previously vowed never to debate Craig. (Craig regularly engages in high-profile debates, including one with prominent atheist Christopher Hitchens at Biola in April 2009). Then, when Craig told him, “Well, I hope we have a good discussion,” Dawkins responded, “I very much doubt it,” and walked away. Though the Mexican showdown might not have been the Craig-Dawkins barnburner some have hoped for, it offered an interesting glimpse at what a future one-on-one debate with Dawkins might look like, said Geivett, who extended his own debate invitation to Dawkins recently on his blog. No scientific proof but a preponderance of evidence for God and His designed purpose. If I were an atheist, would it not be primarily because I want to be my own boss and rule of life maker and thus seek to think of arguements to justify such a worldview?